Thousands of people choose Pentwater for their summer vacation, but it's also a terrific winter getaway. One reason to love Pentwater in the winter is the Pentwater Pathway. It consists of 7.2 different trail miles that form four loops. If you ski each loop, which duplicate in some areas, you'll cover over 15 miles. Pentwater Pathways is located within the Pere Marquette State Forest, and trails are groomed regularly. The area is under the care of the Michigan Wildlife Division of the DNR and the Oceana Cross-Country Association. In the spring, summer and fall you can hike and mountain bike on the trails. Snow lovers find Pentwater Pathways the perfect destination. There is a wide path for skiing, with a flat to moderate grade. 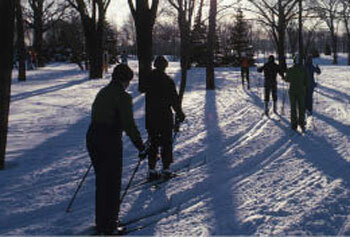 Snowshoers are requested to travel beside the trails rather than on them. Enjoy abundant wildlife in the heavily wooded area and few crowds. No motorized vehicles are allowed and there are no restrooms available. To find the Pentwater Pathway head, take the Pentwater Monroe Road exit off US-31, turn west on Long Bridge Road and then south on Wayne Road. Entrance is about one mile south. Snowshoeing enthusiasts also enjoy Snowshoeing at the Ludington State Park just minutes north of Pentwater.